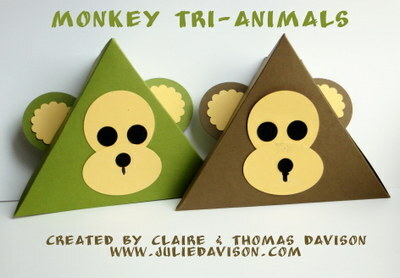 "Tri-Animals are so cool and really fun to make!" 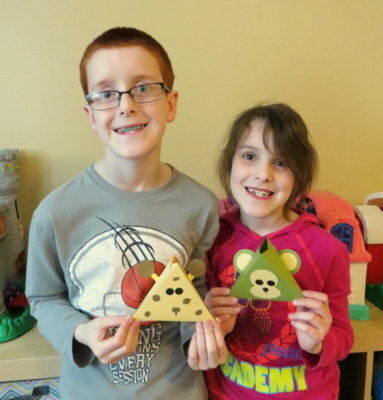 My kids took over my stamp room last week before I left and create an entire zoo of triangle box critters! These are much larger than the ones they made last year. In most cases, the starting piece of cardstock was a half sheet of cardstock: 5-1/2" x 8-1/2". We folded the cardstock in half like you would to make a card. Then we made a mark in the center of the 5-1/2" sides at 2-3/4". Score a diagonal line from the mark down the card fold on all four sides. Click here to see my original post with the video tutorial and the measurements will make more sense. Claire: First I remembered the animal boxes that we made last spring. (See them here.) I told Thomas and we thought we should make them again. So we asked Mom if she remembered how to make them. And she did! (See her tutorial here.) I used bright colors like blue and green even though real animals aren't those colors. I think my mix & match colors are cool and cute, so I like my style. Here are the animals I made. 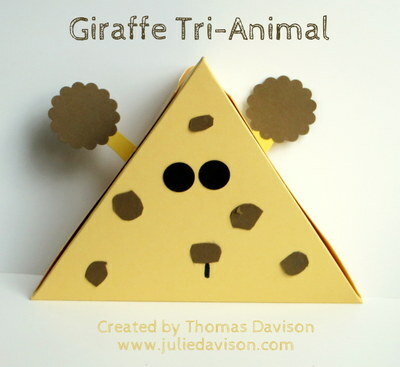 Thomas: My sister and I came up with Tri-Animals because we loved the little critter boxes that we made last Spring. 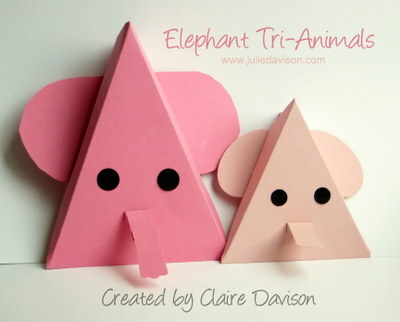 Claire and I renamed the boxes Tri-Animals because they are animals in the shape of a triangle. I made a monkey because it is my favorite animal. I was trying to make a lion, but I couldn't get the mane quite right, so I turned it into a giraffe. 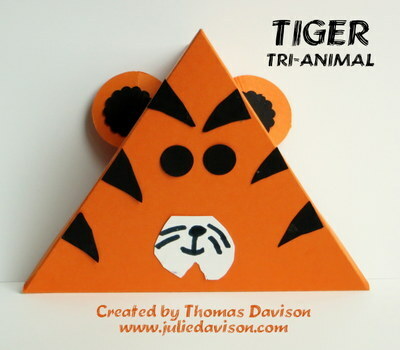 I also picked a tiger because the tiger is ferocious and I had an idea to make cool stripes. Love them! Thomas, and Claire are so creative! My favorites are the Tiger Kitten, and the Tiger! Thanks for sharing the fun ideas! So cute. What creative kids. Runs in the family I guess! I loved the one you made for Easter. I made that one..(30 of them for school) Thank you for sharing.. 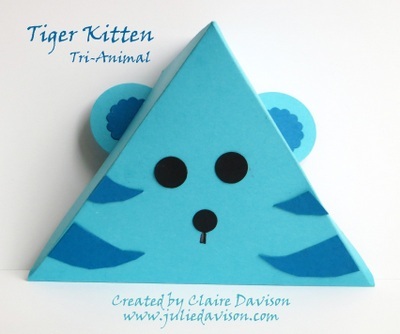 These little boxes are adorable and so are you kids....love that they love crafting!!! !